DATES: May start course at any time, with 2 years to finish. REQUIREMENTS: Must belong to an AKCA affiliated club, or have an individual membership in AKCA. No age requirements. STRONGLY SUGGEST subscription to KOI USA. METHOD: There are 8 units to be completed on line, by Adobe Reader documents and email. Help is available by phone. WET LAB: The 9th unit is the wet lab, which is usually held in conjunction with the annual AKCA business meeting. We are working on changes that will make it easier for everyone to complete this unit and receive certification. Course may be taken without printing anything at all, but you can print it all out if you wish. **NOTE: Course can be taken by regular postal mail, but there is an additional charge. email terry@specialtysteelservice.com or call Terry at 801.631.0414 for more information. APPLICATION: PLEASE READ BEFORE DOWNLOADING. CLICK ON THE LINK FOR THE APPLICATION, WHICH WILL OPEN IT. DO NOT! USE “SAVE AS” OR “SAVE A COPY” – THESE COMMANDS WILL STRIP THE CODING FROM THE DOCUMENT SO THAT YOU CANNOT COMPLETE IT ON LINE. ONCE OPENED AND SAVED, PLEASE COMPLETE AND RETURN IT IN A NEW EMAIL TO ME: terry@specialtysteelservice.com AS AN ATTACHMENT. PAYMENT: After completing the application, you can either pay by check per instructions on the application, or pay here with or without a Paypal account with your credit card. Just click HERE to be redirected to the 2019 AKCA Wet Lab Seminar & Banquet Fees section. The Koi Health Adviser program is a hobbyist to hobbyist support group. It puts more experienced Koi keepers in touch with those learning about the hobby. We’ve all been there before, starting out or relatively new and totally frustrated by a sick Koi in our pond. Who do you call, where do you go for answers? Many pet shops don’t normally deal with ponds and many of the ones that do just say “buy this”, most Veterinarians don’t treat fish or ponds, the agricultural extensions are geared toward farming. Out of this frustration was born the KHA program, taking from AKCA member club’s “help lines”. Hobbyists learn the basic core principals of proper pond design, filtration and water quality. Along with this they learn disease prevention, good nutrition and health basics to become better Koi keepers. Once we are better Koi keepers ourselves we can now help others. Do KHAs take the place of veterinarians who work with koi? Absolutely not! It is not the KHA’s job to diagnose or treat. The KHA is only the first line of defense. If we can teach our fellow hobbyists about good koi care, many problems would be alleviated. The KHA will be an available resource if a problem does arise. We will be there to give advice about how the owner could deal with the problem either by themselves, or with our help teaching them how. If the pond needs the attention of a Veterinary Professional then the KHA can help the owner get in touch with those vets that deal with ponds or give the local vet a vet contact who does deal with ponds for professional information. As the Director, I would like to make sure that all the AKCA clubs are being served well and are able to get the information they need. We need to start by making sure help is available to educate your members and solve problems. To that end I would like for each club to have at least two active KHAs and large clubs should have even more. I would like to challenge each club to support individuals willing to work at becoming a KHA and encourage them to sign up for the course. Wet Lab : Will be conducted at the AKCA Annual Business Meeting. COURSE MATERIAL IS CURRENTLY BEING REVISED BY THESE INSTRUCTORS. Hello all you koi enthusiasts! I am Terry Maxfield, a fellow enthusiast and koi keeper in Farmington, Utah. I recently accepted the position to serve as Director of the AKCA Koi Health Advisor program which I am excited to get started on. By way of introduction, I am a full time business owner/entrepreneur, father, husband, grandfather, avid gardener, and koi nut. Fifteen years ago my sons and I dug a hole, installed a rubber liner, threw in some pea gravel and rocks, moved a few boulders to create a waterfall, and called it a koi pond! We purchased 6 koi for that original pond, 5 of which are still alive. Soon enough, I realized I didn’t know enough about keeping a healthy pond system or a waterfall that didn’t leak. I tired of scooping off bucket loads of string algae and emptying the pond at least once a year to clean the pond scum and leaves out of the filthy gravel. What a stinking mess! Six years ago, much to my wife’s chagrin, I proposed ripping up a nicely landscaped back yard to build a bigger, better, healthier koi pond. My oldest son, an excavator by trade, and I dug out that faulty pond and excavated an enormous canyon off the back porch. We moved the 5 koi to a swimming pool in the garage and added a sand-and-gravel filter to sustain them during construction. They resided in the garage for 2 winters! Total build time on the bigger-better pond and filtration system was nearly 3 years due to 5 children’s weddings and a lot of research on my part into the best filtration and koi keeping methods. A funny side story while the koi were housed in the garage…. when the garage doors were wide open, the noises from the sand and gravel filter flowing into the swimming pool were audible to all passing by. Occasionally we had neighbors and hikers come inquire about the sound of running water emanating from the garage, especially in the colder months, and were surprised to see fish in a swimming pool. One spring day, one of our sons was in the driveway cleaning his motorcycle. The garage doors were wide open. A man from the city irrigation water department made several trips past our house in preparation for the upcoming watering season. The sound of running water certainly caught his attention. He finally stopped to inquire of our son what the sound of water and the big pool in our garage was. Our son said, “There are fish in the pool.” The man was doubtful, so our son invited him to take a look. The man said, “There ARE fish in this pool!” which surprised our son because he had just explained that. Finally the man said, “I thought you guys were growing something illegal and this was your aquaponic system!” We had a good laugh. During my research, I discovered the AKCA and Koi USA Magazine. In the magazine, I read about the Koi Health Advisor (KHA) Program and determined that I would like to take the course to become a certified KHA. My interest in becoming a KHA was to improve my koi keeping knowledge and assist others locally with their koi keeping and pond health. I discovered that there was not a Koi Health Advisor in Utah, so I became the first graduate from our state. I was able to achieve a healthy pond and now have a large and beautiful pond, waterfall, and integrated plant pond home to 21 magnificent koi, ranging from 12 to 30 inches. They over-winter just fine in our cold, windy climate and grow healthy, colorful, and large in our sunny summers. Our pond is 8,700 gallons. We dug the pond with straight sides and it is dished to the lowest point. I brought in a company that installed rebar and Shotcrete to form the large main pond and upper plant pond. I installed two 4-inch bottom drains that feed 2 Cetus sieves. There are two 4-inch skimmers that feed 1 Aqua Forte sieve. I incorporated 2 55-gallon drum sand and gravel filters that feed the waterfall which cascades 6-7 feet into the plant pond, and then into the main pond. Biological filtration is performed via a 4-tray Bakki shower that is filled with feather rock. We also have an Evolution Aqua 110 watt UV filter. To my delight, the upkeep and maintenance on this pond, even as large as it is, has been significantly easier than the old rubber-lined pond with rocks in the bottom. Our koi have thrived and grown in the past 3-4 years that this new pond has been operational. We spend most evenings and weekends on the back porch overlooking our pond and happy, healthy koi. a forum on the AKCA website where certified KHA’s could log in to share experiences, information, and ask questions. 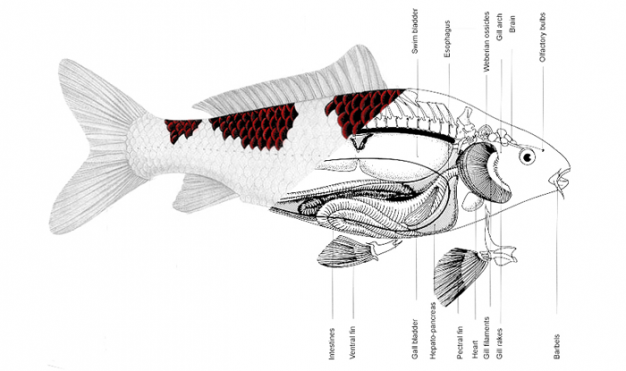 The KHA course of study is of real value to any koi keeper who would like to gain concrete, current knowledge of fish, filtration, pond health, and koi keeping generally. The course costs only $100, and is fully refundable if the course is completed in 2 years! The courses are divided into modules which can be studied, tested for, and completed online at your own pace. The tests are open book. I will be available to students doing course work all along the way via phone or email to answer questions and offer support as they proceed with the course. The Wet Lab portion of the course is attended onsite with other students and is offered once per year in rotating locations throughout the U.S. It is taught by Dr. Nick Saint-Erne, a veterinarian and author specializing in aquatic animals and reptiles. Being able to learn and ask questions of a veterinarian who specializes in, and actually keeps his own koi, is a fun and extremely valuable experience. Under his instruction all can succeed and come away from the hands-on lab with an incredible understanding of anatomy, physiology, use of a microscope, identification of diseases/parasites, and treatment options. Dr. Nick has a teaching style that is not intimidating but fun and easy to understand. As part of the wet lab he will also perform a necropsy on a sick fish so students may see the internal anatomy. Instructions will also be given on how to obtain tissue and mucous samples to prepare slides for microscopic examination and identification of parasites and other diseases, and then each student is given hands on experience doing this themselves. Wet Lab is hosted by the local koi club in whatever city the event is scheduled. It is in conjunction with the AKCA annual meeting and banquet. Watch for further details. The wet lab can be attended at any point of your study, although I found it personally helpful to have completed the other course modules first. Completion of all online modules is not necessary to attend. I invite you to register for the course, chip away at it over the next few months, and come join us next June! For more information about the Koi Health Advisor course, please contact me at terrymaxfield.kha@gmail.com or 801-631-0414.